Should public art come with explanations? And what does it say about us if it gets vandalised? 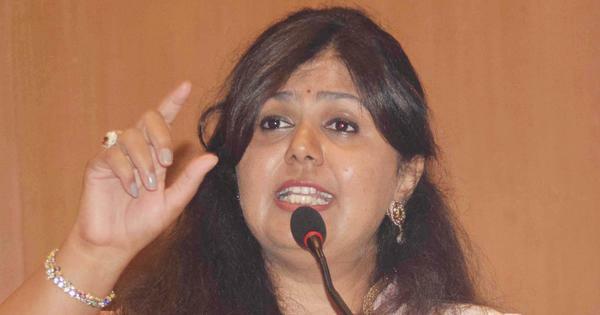 Neeta Vali was power-walking on a hot May morning along with her husband in New Delhi’s favourite spot for constitutionals – Lodi Gardens. 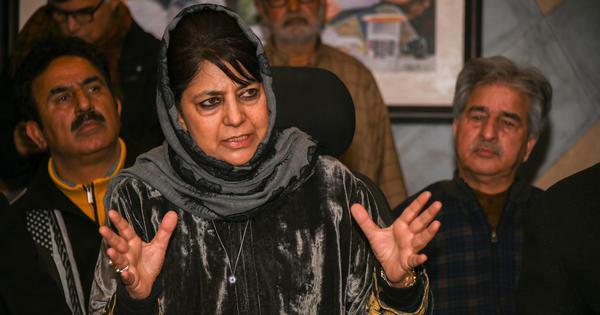 Dressed in cotton T-shirt and track pants, the 54-year-old halted as she saw something new on her route. It seemed like a menhir with tusks impaling the top, placed next to a board listing the various birds that might be seen in the gardens. 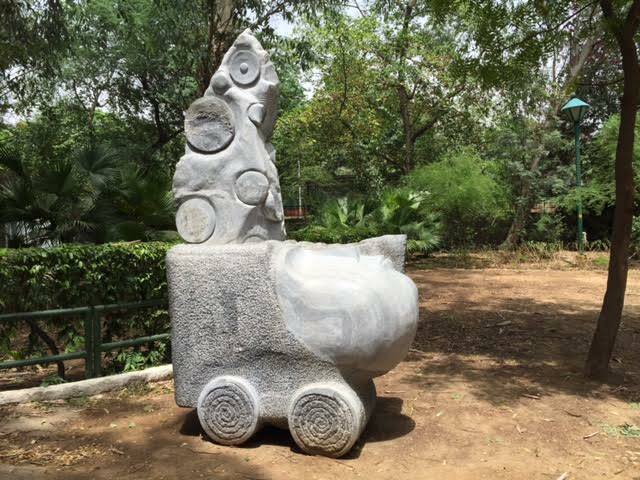 The nearly 10-foot high sculpture was created by Vinod Patel, a stone sculptor from Gujarat, at a camp held in the Capital by the New Delhi Municipal Corporation and Lalit Kala Akademi. Apart from Patel, eight sculptors from across the country participated in the camp in April, as part of India’s Smart City initiative. 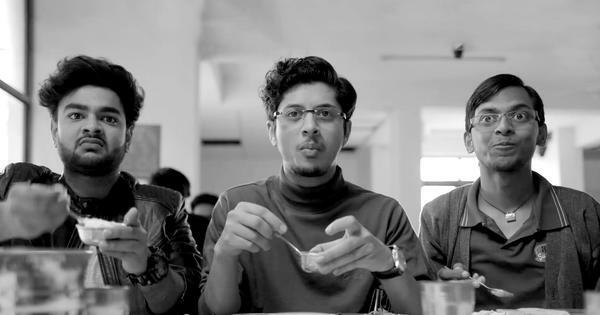 Their aim: to create art to enhance and make-over the urban landscape of New Delhi. The nine sculptors were given access to black stone from Rajasthan and complete creative freedom. 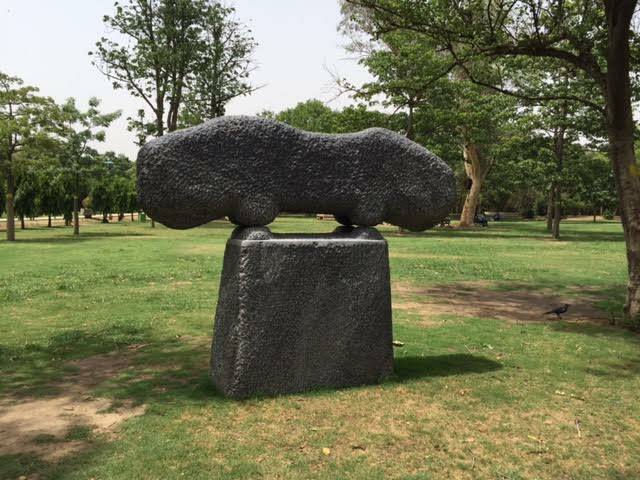 Patel’s work is one of three sculptures placed in Lodi Gardens. 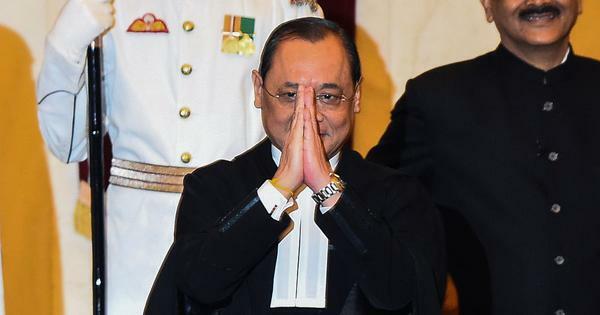 The other two, by Andhra Pradesh’s B Srinivas Reddy and Gujarat’s Deepak Rasaily, have been met with equal confusion. 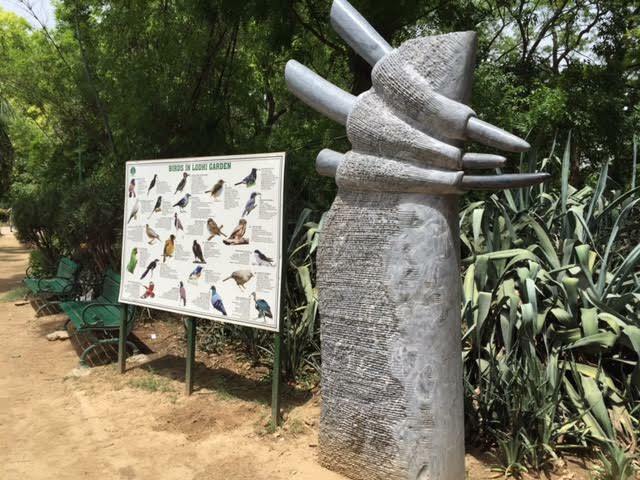 Like Lodi Gardens, artworks installed in Nehru Park and Connaught Place under the project also carry no signboard or placard educating passers-by about them. But Singh had a grouse too – some of the sculptures installed under the art initiative had been defaced. 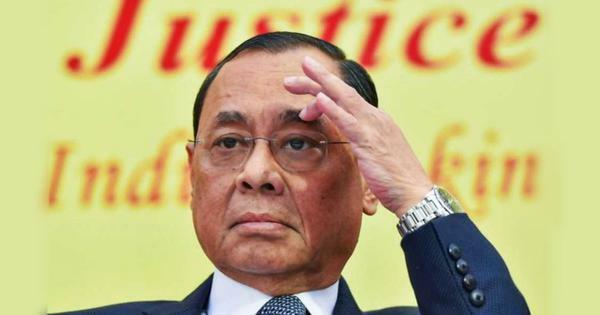 Brimming with anger, Singh pronounces that the people of Delhi don’t “deserve beautiful art”. 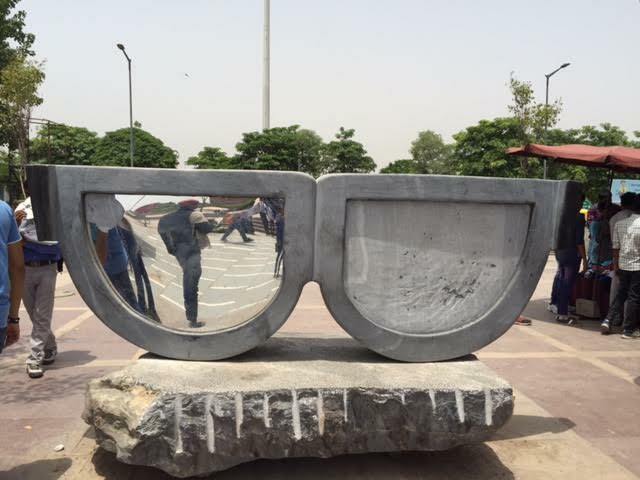 Bhupat Dudi’s sculpture The Mirror at Connaught Place’s Palika Bazaar sought to encourage the public to look at themselves. 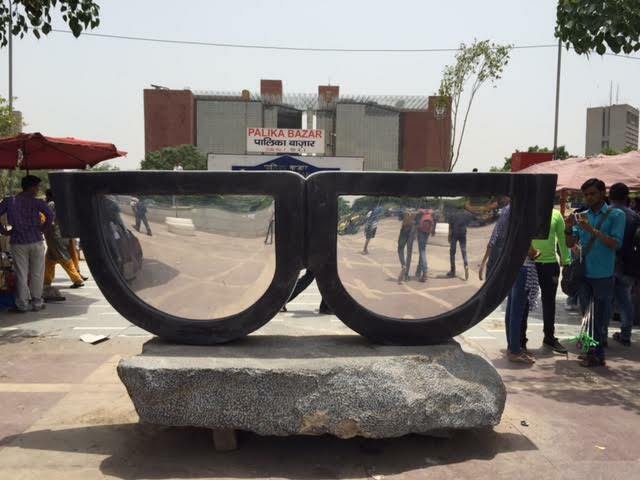 A large pair of spectacles with mirrors for lenses, the artwork was vandalised within weeks of its installation. One of the mirrors on the lenses now lies shattered and the base on which the spectacles are perched acts as a bench for tired shoppers and vendors selling their wares. 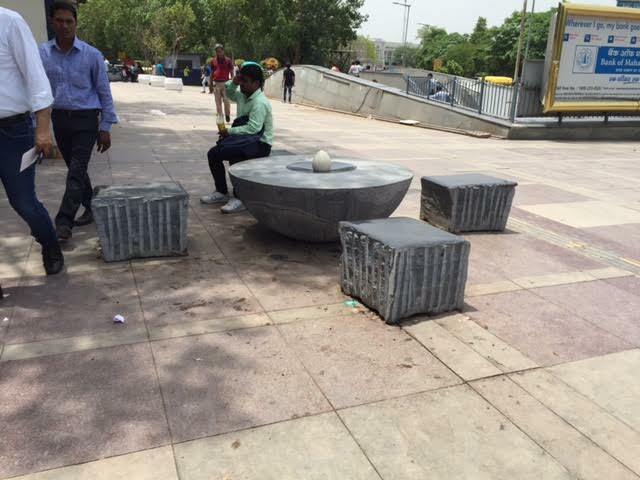 Two more sculptures at the Palika Bazaar footpath have doubled as benches. At least one of them is meant to be sat on. The creation by Karnataka’s S Gopinath, titled Inherent Conversations, invites people to sit and talk to each other. But there aren’t any conversations happening. 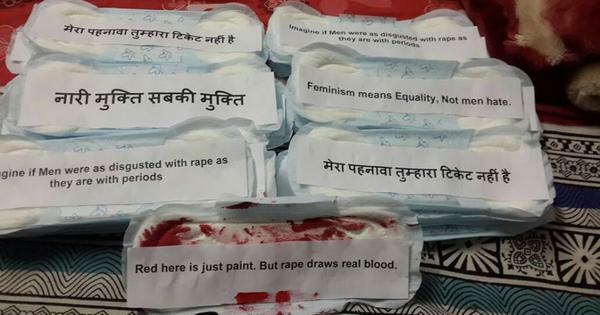 Why are sanitary pads with little notes stuck on trees and walls of Delhi colleges?